Above: Archie’s Waeside owner Bob Rand cuts New York strip steaks. Rand still cuts every steak by hand, on the same butcher block cutting boards he’s used for decades. Bob Rand prepares to cut a slab of prime-grade beef down to perfect steaks to serve at his restaurant. Behind him, beef hangs by hooks in his dry-aging room. About 2 1/2 hours into the 2015 James Beard gala in downtown Chicago, Bob Rand walked across the Civic Opera House stage to accept the “America’s Classic” award for his restaurant, Archie’s Waeside in Le Mars. Famed molecular gastronomist and chef Wylie Dufresne had been honored right before him, and a short video highlighting the dry-aged beef at Archie’s just finished playing on the screen overhead. Rand, in a black suit and gray tie flecked with white spots and wearing the palm-size James Beard medal around his neck, faced the audience of the finest chefs and restaurateurs in America and delivered a short, modest speech thanking everyone from his restaurant bartender to his family and friends. Near the end, after stumbling a bit over his words, he looked up from his notecards and cracked a slight smile. “I didn’t realize the momentum of it until about five minutes ago,” he said. 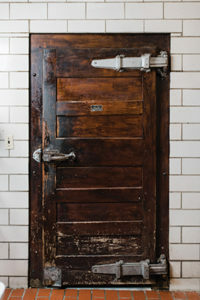 The wooden door leading from the kitchen into the dry-aging cooler is original to the restaurant. Rand returned home from Chicago with extra pressure to live up to Archie’s James Beard award, only the second Iowa restaurant ever to earn one (the first was Breitbach’s Country Dining in Sherrill, in 2009). 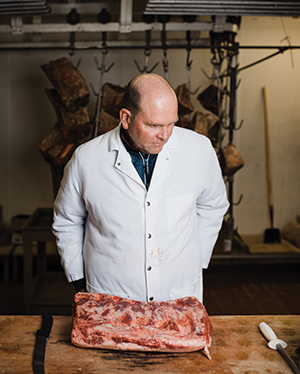 By 2015, Archie’s dry-aged Iowa beef, which hangs in slabs from hooks and sits on racks inside the restaurant’s enormous cooler and dry-aging room, had already been featured in magazines and made national best-steakhouse lists. The James Beard award took things to even higher levels. The restaurant appeared on foodie bucket lists and in the pages of The New York Times. There have been few, if any, slow nights since. 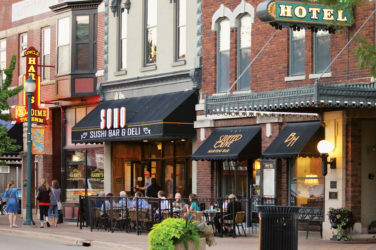 Iowa’s culinary scene continues to evolve, with more ambitious chefs and haute cuisine menus popping up in restaurants across the state. But at Iowa’s best steakhouses, those carnivorous shrines to red meat that are becoming fewer in number each decade, success comes not by innovation in the kitchen but by standing somewhat still in the past, using old traditions to perfect and highlight an ingredient long considered a gold standard of American food: Iowa beef. It’s not on the menu at Archie’s, but diners in the know can order the “Benny Weiker,” a large dry-aged cut of filet named after a well-known beef salesman in the 1950s and ’60s. Weiker was great friends with Archie Jackson, Rand’s grandfather and the original owner of the steakhouse, who escaped the Bolshevik Revolution and worked in stockyards across America before settling in Iowa and opening the restaurant in 1949. Archie’s Waeside’s sprawling dining room is adorned all year long with Christmas house tchotchkes that are part of owner Bob Rand’s mother’s collection. Framed black-and-white photos of Weiker hang in the bar area, where diners waiting up to two hours on the weekends for a table sip glasses of the private-label wine Rand has made, specifically to go with his steaks, with a winery in the Napa Valley since 2011. 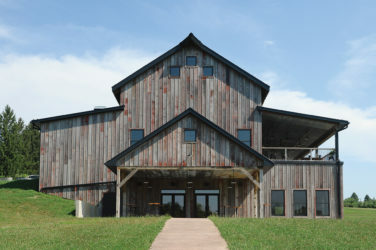 Weiker sold Iowa beef to the finest steakhouses and restaurants in America and considered it to be the best in the world. In the early 1800s, when European-born settlers moved into the Iowa Territory, the land was mostly marsh and prairie, full of grassy hills that looked much like the Flint Hills of eastern Kansas today. As farming technology advanced, including the invention of a steel plow by John Deere in the late 1830s, settlers began clearing those prairies, finding extremely fertile soil. Hundreds of thousands of acres were quickly converted to corn. This was before an efficient railway system, so there was an oversupply of grain, which farmers started feeding to cattle that grazed the pastures, fattening them up before shipping them off to the stockyards in Chicago, Sioux City and Omaha. There, Iowa developed a reputation for raising high-quality, well-marbled, corn-fed beef. Guys like Benny Weiker had no problem selling the meat across America and beyond. Rows of steaks cooking on the massive flat-top grill in the Archie’s Waeside kitchen. 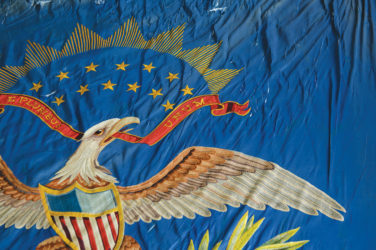 Iowa cattle dominated an ag industry that was the lifeblood of the American economy. For much of the 20th century, the state led the nation in beef production, and also produced more prime-grade meat—fattier, more expensive, more luxurious beef that represents only about 2 percent of all beef sold—than anywhere else. Steakhouses opened in small towns across the state, serving as meeting places and points of pride for the local land and its bounty. Then, our tastes changed. People reduced their consumption of beef, turning to pork and chicken—or no meat at all. According to the USDA, the average American ate 94.1 pounds of beef in 1976. Forty years later, they ate 56.5 pounds. At the same time, Americans more than doubled their consumption of chicken and turkey. Then, farming changed. By the late 1960s and early ’70s, nearly three-quarters of Iowa farms raised cattle. Small farms were diverse operations—pigs out behind the barn, cows in a nearby pasture, rows of corn—with smaller profit margins, so farmers dabbled in livestock to earn short-term cash. Today, farms are more specialized and less than a quarter of Iowa farms raise beef cattle. When it became more profitable to grow grain, farmers plowed up millions of acres of pastureland to plant subsidized row crops. “The cost of land now demands intensive use of the land, and the most intensive use that seems to be the most profitable for the most people is corn and soybeans,” says David Swenson, an Iowa State University economist. The cattle that built Iowa’s beef legacy moved south and west at roughly the same time the meatpacking industry consolidated and started shutting plants across the state. Fewer Iowa cattle now go from birth to plate, though the abundance of nutritious coproducts from the state’s ethanol industry has led to a recent comeback for cattle being shipped here for finishing on feedlots before butchering. Iowa still produces some of the highest-quality beef in the world and ranks in the top 10 in beef production, but it no longer holds its status as the center of the beef world. Owner Bob Rand still inspects every plate before it’s brought out to diners. The beef industry may no longer look as it did in 1975, but much of Archie’s Waeside does. Prices are different, but the menu is similar. Service is straightforward and without theater, and servers still deliver food to tables on pushcarts, guiding them up and down long aisles between the multiple dining rooms covered in wood paneling and adorned with the trademark Christmas tchotchkes belonging to Rand’s mother, Valerie. The steakhouse had long been acclaimed in western Iowa, but after surviving the farm crisis, its reputation—and its business—took off. Archie’s added a larger dining room, a bar area and private wine rooms to keep up. Now it seats 300 and has proved to be recession-proof. On busy nights, cars with license plates from around the country park as far as three blocks away. Rand says only a third of his customers are from Le Mars, a town of about 9,000. An hour before the doors open on a Saturday in late spring, Rand walks through the large cooler just off the kitchen, picking up brawny cuts of filet and ribeye and porterhouse to show off the impeccable marbling that comes with the highest quality of beef. The meat comes from a plant just over the border in Dakota City, Nebraska, which gets its cattle from farms in northwest Iowa and eastern Nebraska. 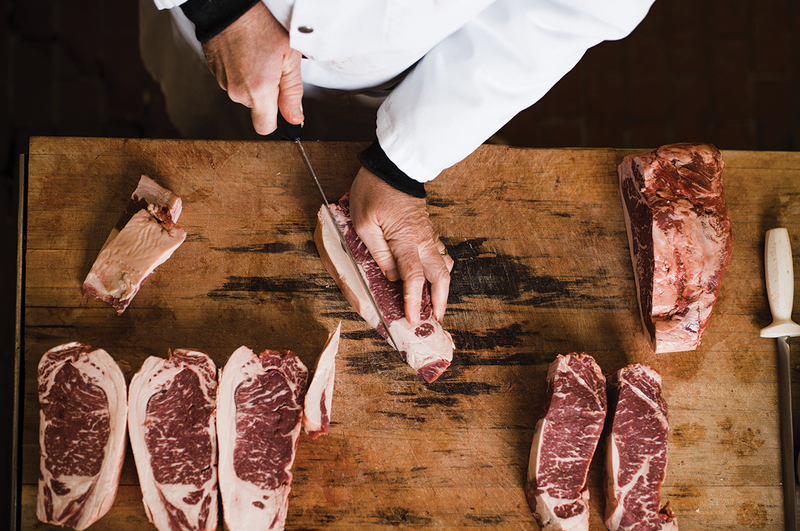 Beef is wet-aged—in Cryovac packaging—before it arrives, then Rand dry ages it for several weeks in his cooler, a process that allows enzymes to break down the tough connective tissue and adds a sweet, complex, often nutty flavor. He points to the large cutting boards, stained and worn from decades of daily use. Beef comes in as short loins, and Rand still cuts every steak on the boards each morning by hand. “I’ve probably cut a million and a half steaks on that one,” he says, rubbing his hand along the side of a thick butcher block his grandfather once used. When the doors open at 5 p.m., the line is already a few dozen deep along the sidewalk outside. A crowd quickly forms in the lounge. Within a half hour, the full restaurant is dancing with activity as diners dig into rich, perfectly crusted steaks, addictive hand-breaded onion rings, Gulf shrimp and mammoth relish trays. Rand still expedites every plate, so he takes his spot in front of a table behind the massive flat-top grill to inspect each steak as it leaves the kitchen. Consistency and quality are key, he says. People travel across the country to eat here, and every steak is somebody’s most important meal that day. “I think about steps we can take to improve every day,” he says. About 175 miles east of Archie’s, Northwestern Steakhouse on the north side of Mason City is another classic Iowa steakhouse seemingly from another time. 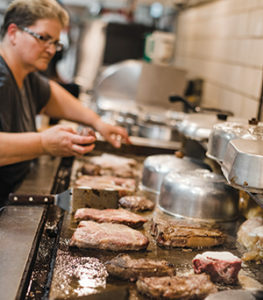 While Archie’s cooks its steaks on a flat-top grill after being coated in salt, pepper and garlic, the aged Iowa beef steaks at Northwestern are broiled in extra virgin olive oil and Greek seasonings. The result is a plate of intensely savory beef bathed in olive oil that—assuming you ordered the filet, as is recommended by most regulars—cuts with a fork. Literally, not merely menu hyperbole here. 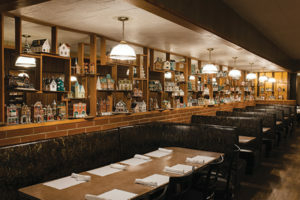 The restaurant, originally called Pete’s Place, has been around in some form since 1920, a time when the city was producing more cement and building material than nearly any city in the world. It moved in 1954 to its current location, a small, easy-to-miss brown brick building in a middle-class neighborhood near baseball fields and a cement plant. A decade later, Pete Maduras sold out to his co-owner Tony Papouchis, and it became Northwestern Steakhouse. Tony manned the broilers into his 90s and tended the restaurant’s large vegetable and herb garden until his death. Tony’s son, Bill, and his wife, Ann, now run Northwestern. Not much has changed, including the steak recipes and the most popular side dish, a splendid, aggressively seasoned plate of spaghetti noodles topped with olive oil, Greek spices and parmesan cheese. Diners don’t seem to mind. A line is already formed outside when the doors open each day at 4:30 p.m. The restaurant barely seats 50, and fills up fast. There’s no dress code, with jeans and windbreakers filling the dining room on a Friday night in spring. “We have families that have been coming to the steakhouse for five generations,” Ann says. 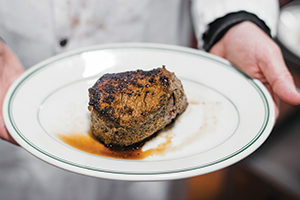 In downtown Des Moines, 801 Chophouse models itself not on the roadhouse- and supper club-style Iowa steakhouses, but on the 1920s-era New York City steakhouses that were dens of extravagance, booze and beef. The restaurant is handsome and masculine. Think cherry wood, marble, etched glass. White tablecloths on each table. Black-and-white photos of cattle, farmers and butchers on the walls. Award-winning wine list. The restaurant looks today as it did the day it opened in 1993, only without the ash trays for cigars or the humidor in the private wine room. Every cut of steak on the menu is prime-grade beef from Holstein dairy cows raised in Iowa and parts of Nebraska and Illinois. Dairy cows move around less than traditional cattle, so the meat is fattier with less muscle and thus are more tender. Steaks are dry-aged in Chicago for at least 35 days before they reach the steakhouse, creating an intense but clean flavor. “Our regulars notice. If we are off by a week or two on the aging, they’ll take one bite and know,” says Brian Dennis, 801’s head chef. Dennis, in a baseball cap and a stained, short-sleeved chef coat, walks through the small kitchen, showing off the special oven bought specifically to cook the prime rib, and the deck broiler that gets up to 800 degrees, putting an extreme sear on the top and bottom of a steak as it cooks. All six of the 801 Chophouses—Des Moines, the original, plus two in Kansas City and ones in Omaha, St. Louis and Denver—have the same look, same feel and same vibe. Des Moines is the smallest market, but finished 2017 with the third-highest revenue. The restaurant has long been considered one of the city’s most revered fine-dining restaurants, a go-to spot for special occasions and important business dinners. Each Iowa caucus season, politicians, campaign workers and media personalities fill the dining room. During the 2004 campaign, The New York Times printed a seating chart that pointed out which TV anchor and celeb had been spotted dining at which table. Dennis and others at the restaurant often joke that 801 is better known in New York than in Iowa. Much like Archie’s and Northwestern, two steakhouses that couldn’t be more different in style and tone from 801, the key to success is consistency and quality, Dennis says. Good beef prepared well. It’s as simple as that. His philosophy, something repeated at all three steakhouses in different ways: Impress the hell out of someone their first time, and they’ll come back.